median (DUM) neurons, known to express two Î±-bungarotoxin-insensitive ..... et al., 2012; Calas-List et al., 2013; List et al., 2014; Mannai et al., 2016). Omar Cauli1, Annalisa Pinna1,2, Valentina Valentini1 and Micaela Morelli*,1,2. 1Department of .... V Â¼Ã7.8 according to the atlas of Pellegrino et al (1979). Dec 31, 2009 - estradiol (E2) or 5Î±-dihydrotestosterone (DHT) are understudied. ... and studies demonstrating testosterone and 5Î±-dihydrotestosterone (DHT). We hypothesized that exposure to PM2.5 can contribute to early kidney ...... (4 days/week, 5 h/ day) in kidney rats, we observed an augment in angiotensin-converter enzyme (ACE) and angiotensin-receptor type-I (AT1R), ..... (DOCX 15 kb). Sep 23, 2005 - Michelle E. Armstrong,1 Ed C. Lavelle,1 Christine E. Loscher,1. Marina A. ..... (I. Stephenson, K. G. Nicholson, A. Rudin, A. Colegate, A. Pod-. Occupational health program to reduce the total fumes exposure, and periodical .... Industrial Hygienists (ACGIH) for welding total fumes, which is 5mg/m .3. 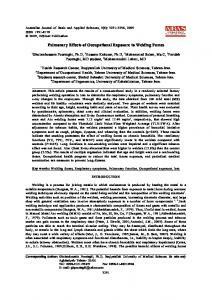 * Correspondence: [email protected] 1 Department of Occupational and Environmental Health, University of Iowa, Iowa City, IA 52242, USA 3 Interdisciplinary Graduate Program in Human Toxicology, University of Iowa, Iowa City, IA 52242, USA Full list of author information is available at the end of the article © 2012 Adamcakova-Dodd et al. ; licensee BioMed Central Ltd. This is an Open Access article distributed under the terms of the Creative Commons Attribution License (http://creativecommons.org/licenses/by/2.0), which permits unrestricted use, distribution, and reproduction in any medium, provided the original work is properly cited. Background Shape modification of nanomaterials, e.g., tailoring them to fiber-shaped nano-objects such as nanowires, nanowhiskers, nanobelts and nanotubes is especially attractive due to the unique properties that they acquire through these alterations . However, the physical properties of the nanomaterials, such as shape or agglomeration state may play an important role in nanoparticle toxicity [2,3]. Recently, an increasing number of studies have focused attention on investigation of fiber-shaped or high aspect ratio nanomaterials (HARNs) due to their asbestos-like morphology and concern that these materials may have similar mechanisms of toxicity [4-10]. HARNs include materials such as carbon nanotubes (CNTs) that have been most studied thus far. According to Institute of Occupational Medicine (IOM, Edinburgh, Scotland), HARNs are classified “as part of the ‘one dimensional’ nanoscale building blocks; other one-dimensional particles include nanobelts and nanoribbons; these are nanostructures with high surface area and high aspect ratio (of greater than 10 to 1, length-to-diameter)” . Key properties influencing pathogenicity of the fibers are fiber dimensions, geometry of the fibers, their biopersistence, high surface area, and surface reactivity [5,11]. It is well established that different types of asbestos fibers have unequal pathogenicity. In the case of asbestos fibers, a higher pathogenicity is associated with slower or no clearance, “frustrated phagocytosis” and thus higher biopersistence of fibers after exposure to long asbestos fibers as opposed to short ones . In addition, the pathogenic potential of titanium dioxide (TiO2), that has been considered to be biologically inert for many years, was changed drastically when the shape of the material was modified . Long micron-sized nanobelts of TiO2 (>15 μm) were shown to be highly toxic particles causing an inflammatory response by alveolar macrophages. Nanomaterials with higher aspect ratios have higher surface areas and thus increased chance of cell interactions. Due to increasing production of HARNs and subsequent increasing potential for inhalation exposure, attention should be paid to development of HARNs that are safe by design before the products are introduced to the market on a large scale [9,13]. Although many of these studies are focused on carbon nanotubes, our study is specifically focused on the toxic effects of commercially available aluminum oxide-based nanowhiskers. Nanowhiskers are single metallic high aspect ratio structures in the nanometer scale, also called nanowires or nanorods. Their diameter is in the nanometer range, however they can be more than a micron in length. Nanowhiskers have unique optical, chemical, and electrical properties. Many nanowhiskers are used for their hydrophobic characteristics. Thus, they find use in wrinkle-free, water or stain resistant clothing . Aluminum oxide nanomaterials have been used as catalysts, catalyst supports, grain-growth inhibitors, heattransfer fluids (suspensions), and polymer nanocomposites . To date, not much research has been done on the behavior of metal oxide nanomaterials with a high aspect ratio in biological systems. The majority of studies have been conducted either in vitro or after instillation exposure, however inhalation is the most relevant route of exposure for evaluation of HARNs. Our study was designed to characterize pulmonary toxicity after inhalation exposure of AO nanowhisker aerosol. For generation of the aerosol we utilized a dry powder generation system developed by our group based on acoustical dry aerosol generator/elutriator [16,17], thus we eliminated a large number of possible interactions of nanomaterials with water or media. Figure 1 Schematic of generation and exposure system used for AO nanowhiskers. Acoustical dry aerosol generator/elutriator (ADAGE) was used to generate AO nanowhisker aerosol. Particle-laden air was pulled to the custom whole-body chamber through venturi aspirator and particle charge neutralizer. Lung, heart, spleen and liver tissues from 6 mice in each group were stored at −80°C after removal. Tissues were lyophilized for approximately 16 hrs at 1.3 × 10-1 mBar and −50°C (Labconco Corp., Kansas City, MO, USA) and then weighed. The tissues were digested in a HotBlock™ digestion system (Environmental Express, Mt. Pleasant, SC, USA) at 95-98°C using mixtures of high purity concentrated nitric acid and hydrochloric acid (Optima grade, Fisher Scientific, Pittsburgh, PA, USA). Metal analysis was performed using ICP-OES (Varian 720 ES, Walnut Creek, CA, USA) with a method detection limit for Al of 0.0016 μg/ g lung (dry wt). BAL fluid was centrifuged at 44,900 x g for 30 min and Al ion concentration in the supernatant was determined by inductively coupled plasmamass spectrometry (ICP-MS, X Series, Thermo Scientific, Waltham, MA, USA). Figure 2 Experimental design for this inhalation study of AO nanowhiskers. A subset of mice (n = 5 per group) were not lavaged but were perfused through the heart with saline and their lungs were fixed using 10% Zn formalin. The lungs were then embedded in paraffin blocks, sectioned at 5 μm and stained with hematoxylin and eosin (H & E). Light field microscopy was used to evaluate stained sections of lung tissues with the focus on presence or absence of inflammatory cells infiltrates, lymphoid agglomerates or fibrosis. Data from controls and AO nanowhisker-exposed mice were compared using t-tests for equal and unequal variance. A p-value less than 0.05 was considered significant. Area under the curve (AUC) was calculated for pulmonary mechanics measurements and R, C and E were compared using analyses of variance (ANOVA) for repeated measures (SAS Ver. 9.2, SAS Institute Inc., Carry, NC, USA). Crystalline phases present in the AO nanowhiskers were determined from powder XRD. These data are shown in Figure 3A. The manufacturer’s stated formula for the nanowhiskers is Al2O3. Attempts to match the XRD pattern of the nanowhiskers with Al2O3 phases were unsuccessful, however, the XRD pattern of the AO nanowhiskers aligned well with XRD patterns of aluminum hydroxide, Al(OH)3, and aluminum oxyhydroxide, γ-AlOOH. Based on the XRD patterns, it appears that the aluminum oxide nanowhiskers are a mixture of bayerite (Al(OH)3) and boehmite (AlOOH) . Additionally, it was determined by ICP-OES analysis that there is about 30% Al in these nanowhiskers by mass. Figure 3 Characterization of the AO nanowhiskers. XRD patterns of the nanowhiskers compared to XRD patterns for two reference materials, bayerite and boehmite (A), X-ray photoelectron spectrum of the nanowhiskers (B), TEM image of AO nanowhiskers deposited from methanol onto TEM grid (C), and size distribution of nanowhisker diameters (D). Primary diameter and length as measured by TEM in our laboratory. The length of the nanowhiskers could not be measured precisely since they appeared as tangled bundles. The length reported by manufacturer was 2800 nm. 2 Geometric mean mobility diameter (GM) and geometric standard distribution (GSD). Figure 4 Dissolution kinetics of AO nanowhiskers in simulated biological fluids. dissolution in ALF buffer, where almost 35% of nanowhiskers were dissolved in 2 wks and about 58% in 4 wks. AO nanowhisker aerosols collected in the exposure chamber were imaged using TEM and SEM (Figure 5A and 5B). Figure 5A is a TEM image of a nanowhisker agglomerate with protruding whiskers. SEM-EDS analysis (Figure 5C) of the agglomerates detected Al at its characteristic X-ray energy within the aerosols. The size distribution of the nanowhisker agglomerates comprising the aerosol in the exposure chamber had a geometric mean mobility diameter (GM) of 150 nm and a geometric standard deviation (GSD) of 1.6 (Figure 6). Retained Al in the lung tissues was determined by ICPOES (Table 2). The mass of Al in sham-exposed mice was very low (0.25 ± 0.17 μg/g lung (dry wt)). Both groups of mice exposed to AO nanowhiskers for 2 or 4 wks had significantly higher (p < 0.001) mass of Al in the lung tissues. The mass of Al in lung tissues from mice exposed for 2 wks and 4 wks was 8.10 ± 0.79 and 15.37 ± 0.31 μg/g lung (dry wt), respectively. These values correspond to 0.24 μg Al/mouse for 2 wk-exposed and 0.51 μg Al/mouse for 4-wk exposed animals. We estimated the deposited dose as a function of minute volume of 25 mL/min, an aerosol concentration of 3.3 mg/m3 and a deposition coefficient of 0.10 in the tracheo-bronchiolar and pulmonary region [26,27]. Using this calculation and considering that the AO nanowhiskers were 30% Al by XRD and ICP-OES, we estimated that 5.88 μg Al/mouse was delivered to the lungs after exposure to AO nanowhiskers for 2 wks and 11.76 μg Al/mouse after 4 wk exposure. Our estimation did not take into the consideration clearance of particulates via the mucociliary escalator to the trachea or gastrointestinal tract, clearance of particulates to lymphatic system, nor translocation of nanomaterial to other organs. We found that there was 4% of retained Al in the lungs from our estimated Al dose. We determined the levels of Al ions in particle- and cell-free BAL fluid by ICP-MS, however the amounts of Al3+ were very low and not different between shams and exposed groups (0.55 μg/L ± 0.40, 0.67 μg/L ± 0.61 and 0.70 μg/L ± 0.28 in shams and in mice exposed for 2 wks and 4 wks, respectively). 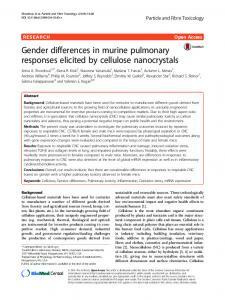 These results show that little AO dissolved in lung fluids. The levels of Al in hearts, spleens and livers were not significantly different between AO-nanowhisker-exposed groups and shams. Figure 5 AO nanowhiskers collected in the exposure chamber. A TEM image (A), SEM image (B) and SEM EDS map (C) of the same region as shown in Figure 5B. Scale bars in 5B and 5 C represent 2.4 μm. Red color represents signal collected at characteristic X-ray energy for Al metal. Figure 6 Particle size distribution of AO nanowhisker aerosols generated by ADAGE to the whole-body exposure chamber. The geometric mean mobility diameter(GM) of aerosolized AO nanowhiskers was 150 nm with geometric standard deviation (GSD) 1.6. Measurement was performed using SMPS sampling exhaust flow from the chamber. Values are expressed as mean and standard error; ***p < 0.001 significantly different from shams. Values are expressed as mean and standard error; *p < 0.05, **p < 0.01, ***p < 0.001 significantly different from sham-exposed animals. Figure 7 Number of differential cells in BAL fluid in sentinels, mice exposed to laboratory air (shams) or mice exposed to AO nanowhiksers for 4 hrs/day for 2 or 4 wks (at daily concentration of 3.3 mg/m2); Data are expressed as mean ± SE; *p < 0.05, **p < 0.01, ***p < 0.001 significantly different from shams. showed no significant differences (Figure 9A and 9B). Thus, inhalation exposure to AO nanowhiskers did not produce clinically significant remodeling of the airway or airway hyperreactivity of the mice. On the other hand, mice exposed to the positive control, bleomycin, developed fibrotic changes and significantly increased pulmonary resistance and decreased compliance measured after methacholine challenge as compared to controls (Figure 9A and B). Discussion Our study is one of few to use a dry powder generation system for inhalation exposure to HARNs. Generation and exposure systems utilizing dry aerosols are the best options to recreate human exposure conditions, since there have been many challenges with characterization of nanomaterials in different milieu (e.g. water or culture media). These challenges are even more pronounced for HARNs mainly due to the higher aspect ratio of fibers in comparison to other nanomaterials as well as increased surface area that can lead to higher surface interactions than other nanomaterials . The Al3+ concentration detected in the lungs of mice after 4 wk exposure to Al nanowhiskers was 0.505 μg Al/ mouse. Considering that 30% of AO nanowhisker mass is Al, the mouse burden of AO nanowhiskers would be 1.68 μg AO nanowhiskers/mouse, which corresponds to the lung burden accumulated by a 70 kg person exposed to a concentration of 1 mg/m3 for 44 hrs (assuming breathing 15 breaths/min, 600 mL/breath, and a pulmonary deposition fraction for 150 nm particles of 0.2  and delivered AO nanowhisker dose to human 4712 μg). Extrapolating mass of AO nanowhiskers per alveolar epithelial surface area for mouse (0.05 m2) and the human (102 m2) , the mouse burden would be 34 μg/m2 and human burden would be 46 μg/m2. Figure 8 Microslides of lung tissue with H&E staining from control mice (A), mice exposed to AO nanowhiskers for 2 (B) or 4 wks (C). Figures D and E show localization of particulates in lung epithelium and macrophages in the lungs from mice exposed to AO nanowhiskers (dark field images, magnification 100 ×). Figure 9 Measurement of pulmonary mechanics in mice exposed to AO nanowhiskers. Pulmonary mechanics measurements expressed as resistance and compliance in sham- and AO nanowhisker-exposed mice after increasing concentration of methacholine (1, 3, 10 and 30 mg/mL). The mean and SE of resistance and compliance versus methacholine concentrations (A). The individual and mean area under the curve (AUC) versus all increasing methacholine concentrations (B). observe an increased production of pro-inflammatory cytokines/chemokines and subsequent higher recruitment of neutrophils that would otherwise lead to pathologic outcomes. Furthermore, AO nanowhiskers may have endured some other changes after entering the respiratory system, such as breakdown that might further increase their clearance from pulmonary system. A number of studies report that surface area of particles is associated with the magnitude of airway inflammation [43-45]. The surface area of AO nanowhiskers (320 ± 4 m2/g) was the largest of all nanomaterials studied thus far by our group [18,29-32]. Therefore and also considering current knowledge about HARNs concerning their toxicity, we hypothesized that there might be a potential for a higher toxicity of this nanomaterial. However, as in our previous study with two TiO2 nanoparticles with different surface areas  as well as other studies [46,47], our results add the evidence that there are many physicochemical properties of nanomaterials that play a role in toxicity. Larger surface area of nanomaterials is only one consideration and is not always responsible for higher toxicity. Other studies have shown that the shape of fibrous material has a decisive role in their toxicity, however AO nanowhiskers that we investigated exhibited low toxicity in this study. Cell surface injury was observed in macrophages exposed to fibrous TiO2, but no significant changes in macrophages were found in case of particulate TiO2 . In vitro study of carbon nanotubes and nanofibers found that long, straight, well-dispersed nanofilaments caused significantly higher production of TNF-α and reactive oxygen species (ROS) in human peripheral blood mononuclear cells than highly curved or tangled materials . fibrous materials or that the deposition coefficient was substantially lower than the assumed 0.10. Abbreviations ADAGE: Acoustical dry aerosol generator/elutriator; Ag: Silver; ALF: Artificial lysosomal fluid; Al(OH)3: Aluminum hydroxide; γ-AlOOH: Aluminum oxyhydroxide; γ-AlOOH: Boehmite; ANOVA: Analyses of variance; AO nanowhiskers: Aluminum oxide-based nanowhiskers; AUC: Area under the curve; BAL: Bronchoalveolar lavage; C: Dynamic compliance; CNTs: Carbon nanotubes; Cu: Copper; E: Dynamic Elastance (E); HARNs: High aspect ratio nanomaterials; H & E: Hematoxylin and eosin; GM: Geometric mean; GM-CSF: Granulocyte macrophage colony stimulating factor; GSD: Geometric standard deviation; ICP-MS: Inductively coupled plasma-mass spectrometry; ICP-OES: Inductively coupled plasma - optical emission spectroscopy; IL: Interleukin; IFN: Interferon; KC: Keratinocyte-derived cytokine; LDH: Lactate dehydrogenase; MCP: Monocyte chemotactic protein; MIP: Macrophage inflammatory protein; MMAD: Mass median aerodynamic diameter; PAS: Portable aerosol spectrometer; R: Dynamic resistance; SEM-EDS: Scanning electron microscope equipped with energy dispersive spectrometer; SMPS: Scanning mobility particle sizer; TEM: Transmission electron microscopy; TiO2: Titanium dioxide; TNF: Tumor necrosis factor; XPS: X-ray photoelectron spectroscopy; XRD: Powder X-ray diffraction. Competing interest Vicki H. Grassian holds stock in Nanoscale Corp. (Manhattan, KS, USA). Authors' contributions AAD participated in the study design, conducted the animal exposure studies, biological assays, pulmonary mechanics measurements, data analysis, and drafted the manuscript; LVS performed nanomaterial characterization, dissolution studies, elemental analyses, and drafted parts of the manuscript. PTO designed the acoustical dry aerosol generator, set up and coordinated aerosol generation system for inhalation exposures; characterized exposure concentrations and aerosol size distribution. JSK participated in the study design, conduction of animal studies, biological assays and elemental analyses; VHG initiated nanomaterial shape dependent studies and the integrated study design as well as led analyses of nanomaterial characterization and dissolution data and edited the manuscript; PST designed the acoustical dry aerosol generator, designed the animal study, coordinated biological assays and data analysis, and authored the final manuscript. All authors read and approved the final manuscript. Acknowledgements This study was supported by NIOSH (National Institutes of Occupational Safety and Health) grant R01 OH009448 and NIEHS grant P30 ES005605. We thank to Ralph Altmaier, MS and Xin Hu for his help with ADAGE and set up of inhalation exposure system, also Jonas Baltrusaitis, PhD for his help with TEM. 19. Author details Department of Occupational and Environmental Health, University of Iowa, Iowa City, IA 52242, USA. 2Department of Chemistry, University of Iowa, Iowa City, IA 52242, USA. 3Interdisciplinary Graduate Program in Human Toxicology, University of Iowa, Iowa City, IA 52242, USA. Received: 23 November 2011 Accepted: 17 May 2012 Published: 19 June 2012 References 1. Xia Y, Yang P, Sun Y, Wu Y, Mayers B, Gates B, Yin Y, Kim F, Yan H: OneDimensional Nanostructures: Synthesis, characterization, and applications. Adv Mater 2003, 15(5):353–389. 2. Maynard AD, Aitken RJ, Butz T, Colvin V, Donaldson K, Oberdorster G, Philbert MA, Ryan J, Seaton A, Stone V, Tinkle SS, Tran L, Walker NJ, Warheit DB: Safe handling of nanotechnology. Nature 2006, 444(7117):267–269. 3. Elder A, Yang H, Gwiazda R, Teng X, Thurston S, He H, Oberdörster G: Testing nanomaterials of unknown toxicity: an example based on platinum nanoparticles of different shapes. Adv Mater 2007, 19(20):3124–3129. 4. Tomatis M, Turci F, Ceschino R, Riganti C, Gazzano E, Martra G, Ghigo D, Fubini B: High aspect ratio materials: role of surface chemistry vs.
length in the historical "long and short amosite asbestos fibers". Inhal Toxicol 2010, 22(12):984–998. Donaldson K, Murphy FA, Duffin R, Poland CA: Asbestos, carbon nanotubes and the pleural mesothelium: a review of the hypothesis regarding the role of long fibre retention in the parietal pleura, inflammation and mesothelioma. Particle and fibre toxicology 2010, 7:5. Turci F, Tomatis M, Lesci IG, Roveri N, Fubini B: The iron-related molecular toxicity mechanism of synthetic asbestos nanofibres: A model study for high-aspect-ratio nanoparticles. Chemistry (Weinheim an der Bergstrasse, Germany). Tran CL, Hankin SM, Ross B, Aitken RJ, Jones AD, Donaldson K, Stone V, Tantra R: An outline scoping study to whether or not high-aspect-ration nanoparticles (HARN) should raise the same concerns as do asbesots fibers. Edinburgh: Institute of Occupational Medicine; 2008. Poland CA, Duffin R, Kinloch I, Maynard A, Wallace WA, Seaton A, Stone V, Brown S, Macnee W, Donaldson K: Carbon nanotubes introduced into the abdominal cavity of mice show asbestos-like pathogenicity in a pilot study. Nat Nanotechnol 2008, 3(7):423–428. Donaldson K, Murphy F, Schinwald A, Duffin R, Poland CA: Identifying the pulmonary hazard of high aspect ratio nanoparticles to enable their safety-by-design. 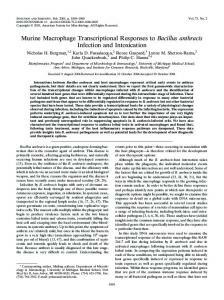 Nanomedicine (London, England) 2011, 6(1):143–156. Murphy F A, Poland CA, Duffin R, Al-Jamal K T, Ali-Boucetta H, Nunes A, Byrne F, Prina-Mello A, Volkov Y, Li S, Mather S J, Bianco A, Prato M, Macnee W, Wallace W A, Kostarelos K, Donaldson K: Length-dependent retention of carbon nanotubes in the pleural space of mice initiates sustained inflammation and progressive fibrosis on the parietal pleura. Am J Pathol 2010, 178(6):2587–2600. Kane AB, Hurt RH: Nanotoxicology: the asbestos analogy revisited. Nat Nanotechnol 2008, 3(7):378–379. Hamilton RF, Wu N, Porter D, Buford M, Wolfarth M, Holian A: Particle length-dependent titanium dioxide nanomaterials toxicity and bioactivity. Particle and fibre toxicology 2009, 6:35. Liu X, Guo L, Morris D, Kane AB, Hurt RH: Targeted removal of bioavailable metal as a detoxification strategy for carbon nanotubes. Carbon N Y 2008, 46(3):489–500. Miller J, Cho KJ, McGehee M: A realistic assessment of the commercialization of nanotechnology: A primer for lawyers and investors. Nanotechnology Law & Business 2004, 1(1):1–13. Meliorum Technologies I: List of Applications. Aluminum Oxide Nanomaterials. 2008. [cited 2011 10/27/2011]; Available from: http://www.meliorum.com/ fullapplicationslist.htm. Thorne PS: Experimental grain dust atmospheres generated by wet and dry aerosolization techniques. American journal of industrial medicine 1994, 25(1):109–112. Weyel DA, Ellakkani M, Alarie Y, Karol M: An aerosol generator for the resuspension of cotton dust. Toxicol Appl Pharmacol 1984, 76(3):544–547. Pettibone JM, Adamcakova-Dodd A, Thorne PS, O'Shaughnessy PT, Weydert JA, Grassian VH: Inflammatory response of mice following inhalation exposure to iron and copper nanoparticles. Nanotoxicology 2008, 1:1–16. Stopford W, Turner J, Cappellini D, Brock T: Bioaccessibility testing of cobalt compounds. J Environ Monit 2003, 5(4):675–680. Cheng YS, Barr EB, Yeh HC: A venturi disperser as a dry powder generator for inhalation studies. Inhal Toxicol 1989, 1(4):365–371. O'Shaughnessy PT, Achutan C, O'Neill ME, Thorne PS: A small whole-body exposure chamber for laboratory use. Inhal Toxicol 2003, 15(3):251–263. Murthy S, Adamcakova-Dodd A, Perry SS, Tephly LA, Keller RM, Metwali N, Meyerholz DK, Wang Y, Glogauer M, Thorne PS, Carter AB: Modulation of reactive oxygen species by Rac1 or catalase prevents asbestos-induced pulmonary fibrosis. Am J Physiol 2009, 297(5):L846–55. Park H, Grassian VH: Commercially manufactured engineered nanomaterials for environmental and health studies: important insights provided by independent characterization. Environmental toxicology and chemistry / SETAC 2010, 29(3):715–721. Navarro E, Piccapietra F, Wagner B, Marconi F, Kaegi R, Odzak N, Sigg L, Behra R: Toxicity of silver nanoparticles to Chlamydomonas reinhardtii. Environ Sci Technol 2008, 42(23):8959–8964. Kloprogge JT, Duong LV, Wood BJ, Frost RL: XPS study of the major minerals in bauxite: gibbsite, bayerite and (pseudo-)boehmite. J Colloid Interface Sci 2006, 296(2):572–576. Asgharian B, Price OT: Airflow distribution in the human lung and its influence on particle deposition. Inhal Toxicol 2006, 18(10):795–801. 27. Cassee FR, Freijer JI, Subramaniam R, Asgharian B, Miller FJ, van Bree L, Rombout PJA: Development of a model for human and rat airway particle deposition: implications for risk assessment 1999. Bilthoven, the Netherlands: Dutch National Institute of Public Health and Environment (RIVM); 1999. 28. Stone KC, Mercer RR, Gehr P, Stockstill B, Crapo JD: Allometric relationships of cell numbers and size in the mammalian lung. American journal of respiratory cell and molecular biology 1992, 6(2):235–243. 29. Grassian VH, O'Shaughnessy PT, Adamcakova-Dodd A, Pettibone JM, Thorne PS: Inhalation exposure study of titanium dioxide nanoparticles with a primary particle size of 2 to 5 nm. Environ Heal Perspect 2007, 115(3):397–402. 30. Grassian VH, Adamcakova-Dodd A, Pettibone JM, O'Shaughnessy PT, Thorne PS: Inflammatory response of mice to manufactured titanium dioxide nanoparticles: Comparison of size effects through different exposure routes. Nanotoxicology 2007, 1(3):211–226. 31. Stebounova LV, Adamcakova-Dodd A, Kim JS, Park H, O'Shaughnessy PT, Grassian VH, Thorne PS: Nanosilver induces minimal lung toxicity or inflammation in a subacute murine inhalation model. Particle and fibre toxicology 2011, 8(1):5. 32. Kim JS, Adamcakova-Dodd A, O'Shaughnessy PT, Grassian VH, Thorne PS: Effects of copper nanoparticle exposure on host defense in a murine pulmonary infection model. Particle and fibre toxicology 2011, 8:29. 33. Schmoll LH, Elzey S, Grassian VH, O'Shaughnessy PT: Nanoparticle aerosol generation methods from bulk powders for inhalation exposure studies. Nanotoxicology 2009, 3(4):265–275. 34. Kaegi R, Ulrich A, Sinnet B, Vonbank R, Wichser A, Zuleeg S, Simmler H, Brunner S, Vonmont H, Burkhardt M, Boller M: Synthetic TiO2 nanoparticle emission from exterior facades into the aquatic environment. Environ Pollut 2008, 156(2):233–239. 35. Xia T, Kovochich M, Liong M, Madler L, Gilbert B, Shi H, Yeh JI, Zink JI, Nel AE: Comparison of the mechanism of toxicity of zinc oxide and cerium oxide nanoparticles based on dissolution and oxidative stress properties. ACS nano 2008, 2(10):2121–2134. 36. Muller KH, Kulkarni J, Motskin M, Goode A, Winship P, Skepper JN, Ryan MP, Porter AE: pH-dependent toxicity of high aspect ratio ZnO nanowires in macrophages due to intracellular dissolution. ACS nano 2010, 4(11):6767–6779. 37. Kraemer SM, Chiu, Van Q, Hering JG: Influence of pH and competitive adsorption on the kinetics of ligand-promoted dissolution of aluminum oxide. Environ Sci Technol 1998, 32(19):2876–2882. 38. Furrer G, Stumm W: The coordination chemistry of weathering: I. Dissolution kinetics of alumina and beryllium oxide. Geochimica et Cosmochimica Acta 1986, 50(9):1847–1860. 39. Johnson SB, Brown GE Jr, Healy TW, Scales PJ: Adsorption of organic matter at mineral/water interfaces. 6. Effect of inner-sphere versus outer-sphere adsorption on colloidal stability. Langmuir 2005, 21(14):6356–6365. 40. Martin RB: Citrate binding of Al3+ and Fe3+. J Inorg Biochem 1986, 28(2–3):181–187. 41. Blais MJ, Berthon G: Citrate interactions in blood plasma. Quantitative study of the metal ion equilibriums in the zinc - citrate -histidinate, -glutaminate and threoninate systems and computer simulation of the ability of citrate to mobilize the low molecular weight fraction of zinc. Inorganica Chimica Acta 1982, 67(3):109–115. 42. Pauluhn J: Pulmonary toxicity and fate of agglomerated 10 and 40 nm aluminum oxyhydroxides following 4-week inhalation exposure of rats: toxic effects are determined by agglomerated, not primary particle size. Toxicol Sci 2009, 109(1):152–167. 43. Cullen RT, Tran CL, Buchanan D, Davis JM, Searl A, Jones AD, Donaldson K: Inhalation of poorly soluble particles. I. Differences in inflammatory response and clearance during exposure. Inhal Toxicol 2000, 12(12):1089–1111. 44. Duffin R, Tran L, Brown D, Stone V, Donaldson K: Proinflammogenic effects of low-toxicity and metal nanoparticles in vivo and in vitro: highlighting the role of particle surface area and surface reactivity. Inhal Toxicol 2007, 19(10):849–856. 45. Tran CL, Buchanan D, Cullen RT, Searl A, Jones AD, Donaldson K: Inhalation of poorly soluble particles. II. Influence of particle surface area on inflammation and clearance. Inhal Toxicol 2000, 12(12):1113–1126. 46. Lanone S, Rogerieux F, Geys J, Dupont A, Maillot-Marechal E, Boczkowski J, Lacroix G, Hoet P: Comparative toxicity of 24 manufactured nanoparticles in human alveolar epithelial and macrophage cell lines. Particle and fibre toxicology 2009, 6:14. 47. Warheit DB, Webb TR, Sayes CM, Colvin VL, Reed KL: Pulmonary instillation studies with nanoscale TiO2 rods and dots in rats: toxicity is not dependent upon particle size and surface area. Toxicol Sci 2006, 91(1):227–236. 48. Watanabe M, Okada M, Kudo Y, Tonori Y, Niitsuya M, Sato T, Aizawa Y, Kotani M: Differences in the effects of fibrous and particulate titanium dioxide on alveolar macrophages of Fischer 344 rats. J Toxicol Environ Heal 2002, 65(15):1047–1060. 49. Brown DM, Kinloch IA, Bangert U, Windle AH, Walter DM, Walker GS, Scotchford CA, Donaldson K, Stone V: An in vitro study of the potential of carbon nanotubes and nanofibres to induce inflammatory mediators and frustrated phagocytosis. Carbon 2007, 45(9):1743–1756. doi:10.1186/1743-8977-9-22 Cite this article as: Adamcakova-Dodd et al. : Murine pulmonary responses after sub-chronic exposure to aluminum oxide-based nanowhiskers. Particle and Fibre Toxicology 2012 9:22. 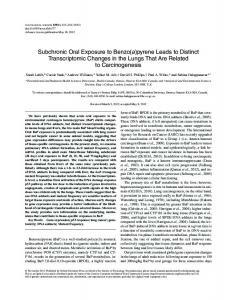 Report "Murine pulmonary responses after sub-chronic exposure to aluminum ..."